Congratulations on reaching your final year of academic training. 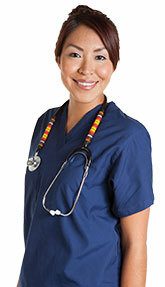 Before beginning your Indian health career, many of you will enter into a required or optional post-graduate clinical training program in pursuit of board certification or licensure in your chosen health profession. The following documents are required prior to or immediately after graduation. Notice of Impending Graduation [PDF 94KB] — Due at the beginning of your final academic term. A copy of your diploma — Due immediately after graduation. Final official transcript documenting the degree awarded — Due immediately after graduation. License/board certification — Due immediately after graduation or as soon as it becomes available. The following forms are required to prepare for and select your post-graduate clinical training program. Request for Approval of Deferment (IHS-856-11) [PDF 94KB] — This form must be submitted at the beginning of your final year of school documenting the programs that you are considering after graduation. Notification of Deferment Program (IHS-856-14) [PDF 90KB] — This form must be submitted no later than the first day of your final month of school notifying the program of which IHS-approved post-graduate clinical training program you will attend. The IHS Scholarship Program has identified a list of health professions approved for deferment of your service commitment and the eligible post-graduate clinical training programs associated with those health professions. IHS must approve all post-graduate training; the program officially recognizes only those training programs approved by the appropriate American specialty board. If you enter a program that was not approved by the IHS Scholarship Program, you will be in breach of your contract and placed in default. It’s important to keep in mind that you are required to begin your training program within 90 days after graduation. Failure to secure a position in an IHS-approved program will result in placement at an in-need facility or a breach of contract and placement in default. For detailed information about post-graduate clinical training policies and procedures and the documentation needed to update IHS Scholarship Program staff as you complete your program, consult your Service Commitment Handbook [PDF 2.6MB]. Contact your Program Analyst with questions regarding your transition from student to Indian health professional.